Here at Upwave, we want to support your team wherever and however they work. Many of our teams use Slack for instant messaging in their worklife every day, and we do too. Use our integration to get updates in Slack when changes are made on a board. 1. You’ll need to enable slack integration for each board. That way you can keep updates separate and easier to track. 2. You need to be an admin of your Upwave account to set this up - Go to your Workspace Settings page to check. 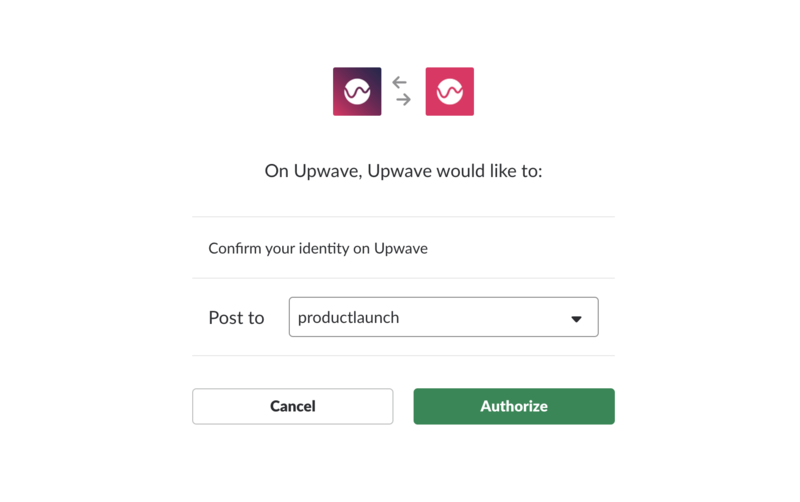 In Slack, create the channel where you want your Upwave board updates to be posted. In this example, our slack channel is called “productlaunch″. In Upwave, go into the board you want to integrate with Slack, click the drop down menu, select "Board settings" and then "Integrations". Click on "Add to Slack". You’ll now be asked to authorize access to Slack. Before autorizing, make sure you connect your Upwave board to the right Slack channel. Does Upwave get full access to my Slack channels? No, Upwave has no mechanism to gain "real" access to your channel. Upwave will be given access to post messages to your channel but that's it! You can revoke access at any time. How can I revoke access? In Slack there is a "Manage Apps" panel where all your authorized Apps are listed. Here you can remove an entire App, or delete channel-specific configurations. First you need to sign up at www.upwave.io and create your account. It's super simple and will guide you through account creation and all the way through setting up your first Upwave board.